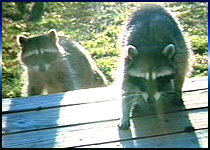 OLYMPIA, Washington — A fierce group of raccoons has killed 10 cats, attacked a small dog and bitten at least one pet owner who had to get rabies shots, residents of Olympia say. Some have taken to carrying pepper spray to ward off the masked marauders and the woman who was bitten now carries an iron pipe when she goes outside at night. The neighbors hired trapper Tom Brown, a nuisance wildlife control operator from Rochester. He said he’s seen packs this big, but none so into killing. There was one in Rochester that killed a peacock last winter and another in Grand Mound that killed three chickens. But nothing like this. Brown said there is an overabundance of food in the area with many fruit trees. Normally, Brown said, he can fix a problem in a few weeks, but he has set traps there for six weeks and caught only one. Brown said he hasn’t trapped more because raccoons are intelligent. They teach their young, the same as beavers do. He said one big male boar is the main killer, and he’s tasted blood, and he wants more. He’s usually helped by one or two others. “The boar’s likely been in a live trap before,” Brown said. Brown said he’s going to back off for a while until the food supply dries up. “Then they’ll be a little less persnickity,” Brown said. He said his goal is to make them feel uncomfortable. Until that happens, they aren’t likely to leave. “We have our favorite restaurants; they have their favorite routes,” he said.